Photo above: New Generations Leading Forward at the NALAC Regional Training in Miami. Photo by Luis Garza. What would it mean to look at Latina participation in the workforce through the lens of equity? Perhaps the first thing we'd want to do is unfold our idea of equality to see what other important themes, topics, and aspects of our labor force it's connected with. Most likely, these connectors will relate to a range of pretty distinct spheres of activity: from aesthetics to politics, from culture to ethnicity, and from classrooms to class status. The fact that our understanding of work or labor isn't bound to any one particular experience within our lives is a big giveaway too, suggesting that whatever productivity may be or possibly mean is less of a fixed matter and more of a dynamic result. 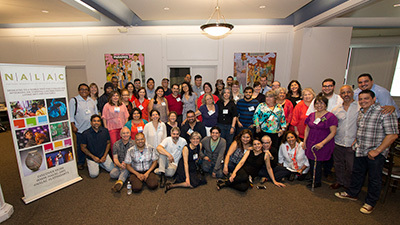 2015 NALAC Regional Arts Training Workshop participants at The Carr Center in Detroit. Photo by Luis M Garza. We're bringing our celebrated regional training home to San Antonio next month. Join artists, leaders and advocates for professional development and dialogue about the state of Latino arts and culture in the country and world today. Now's the time to make plans to join us for a rejuvenating, inspiring two days of interactive workshops, discussion forums, technical assistance and performances. This special event will be hosted at the Guadalupe Cultural Arts Center on Friday, April 29 and Saturday, April 30. Sign-up online right now! It's just $20 for NALAC members and $40 for future members. Agustina Woodgate, 2013 NALAC Fund for the Arts Grantee. Photo by Anthony Spinello. Latino artists and arts organizations are often at the forefront of social change. NALAC Fund for the Arts supports this work. For more than 10 years, the NFA has provided a variety of grants to assist US-based Latino artists and arts organizations in the development, creation, presentation and sustainability of artistic excellence. Over $1 million has been awarded to a diverse range of artists and organizations. Application materials will be posted online later this month here. With support from the Kellogg Foundation, we're making strategic investments in Michigan to bolster leadership development, grow networks and partnerships, and provide financial resources for artists and organizations involved in effecting change through arts and culture. Consider applying for our Research Associate position in Michigan. Job details and application process can be found online here. Thanks to the good work of Luis Garza in our NALAC office, we have a brand new online store. Now, you can make a gift to support our ongoing advocacy, training and grant programs, sign-up for our regional trainings, and much more with the click of a mouse. Check it out (and even make a donation) right now. NALAC Grantee Michèle Stephenson is one of the creators of an op-ed documentary series in The New York Times on race. Watch and read it here. The Latino Art Now! Conference is the leading national forum for artists, art historians, art professionals, educators, scholars, critics and art dealers. The Fifth Biennial Latino Art Now! Re-imagining Global Intersections Conference in Chicago will examine the contemporary shifting contours of US Latino art and the (trans) national and global cultural forces that continuously shape it and how it in turn shapes these forces. We were saddened to hear of the passing of activists who paved the way for our work today. We honor the below, and remember all those who have died at the hands of injustice.